Whilst I'm sure that it is an impossible task to catalogue all the times that Harry's music has been played on the radio or television, I'll list as many examples of broadcast concerts and performances as I can find. If you know of anything that is not listed here or if you have any tapes of broadcasts, then please get in touch with me at the website email address. 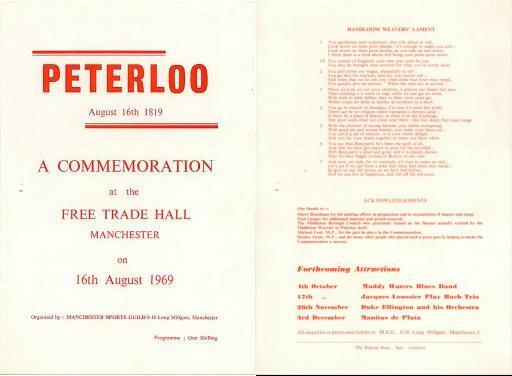 On 16th August 1969, the Manchester Sports Guild organised a concert at the Free Trade Hall in Manchester in commemoration of the 150th anniversary of the event that came to be known as the Peterloo Massacre. The speaker was Michael Foot M.P. 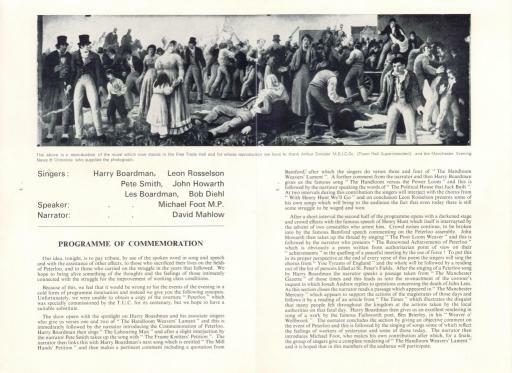 On the fields of Peterloo"
This was the first programme of a spin off from Folk on Friday where the team recorded concerts for broadcast. This particular programme featured The Taverners, Harry Boardman and The Pendle Folk and was recorded at Nelson & Colne College of Further Education in Lancashire. There was also the first performance of "Ballad of the North West" compiled by Alan Bell. The Pendle Folk contributed with Water Cress-O & The Rawtenstall Annual Fair. At the end of the concert, Harry led the final song - Liverpool Judies. Following this, I wrote several radio scripts for Peter Pilbeam who produced programmes from Manchester. Using the title "Ballads of the North West", the 30 minute programmes featured different stories from different areas within the region. In early 1972 I met Douglas Boyd - an independant TV producer working to contracts from the BBC. Douglas had also just met Ken Campbell from the Pendle Folk group who was also writing scripts at the time. Having heard the Cape Famine programme, I took Douglas to Sunderland Point and he was captivated by the place. He then made the decision to produce the TV series. A documentary TV series that showed how the events of the past two hundred years in the area have been reflected in song. There were three series of programmes made and broadcast and the titles and transmission dates are set out below - Again thanks to Alan Bell for providing this information from his records.
" 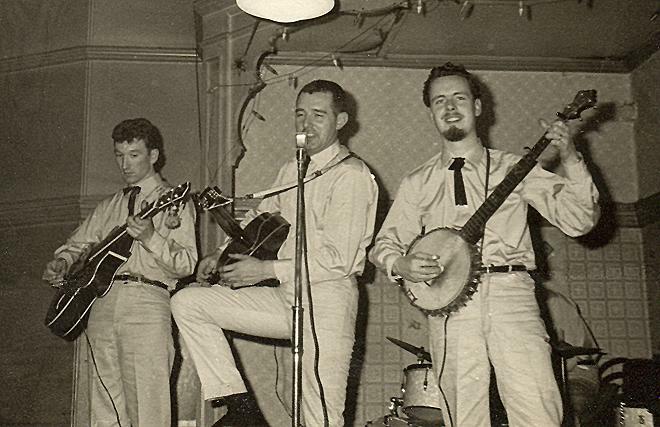 The photograph was taken whilst we were playing with Yonko and the Texas Drifters in either 1960 or 1961 - possibly at the Waterloo hotel in the Cheetham Hill area of Manchester. Other venues I remember were the Balmoral hotel, the Russell, Starlight and York clubs, and many other venues in the North West. Although Harry was more interested in Folk music, he was a brilliant Blue Grass and American style banjo player and vocalist and I remember many occasions when we travelled home from gigs with the neck of Harry's banjo sticking out of the car window and we sang all the way home." This was a radio production about the legend of Alderley Edge in Cheshire. It was written by Joe Beard and produced by Harry Ogden – one time presenter of Piccadilly Folkspan (Manchester) and featured Harry Boardman playing ‘The Wizard’. A copy of the original broadcast tape of this has apparently been given to the National Trust to archive. I have been in touch with both Joe and The NT to confirm this. 1. SKYLINE/ THE EDGE (OF TIME) - Instr. 3. SLEEPING KNIGHTS - Instr. Most of the recording was done in CAVALIER STUDIOS, Stockport, with bits and pieces added in PICCADILLY RADIO itself prior to broadcast. A live multi media show performed it at several concerts clubs, festivals to great acclaim but it needed big money to justify it. North West Arts provided a small grant at the time but more was needed. Today I would describe this project differently but then it was looked on as Folk/Rock. Today it may be put into several categories - FOLK/ROCK/GOTHIC/PSYCHEDELIA multi media. I have toyed with the idea of taking it into schools modified for children as the Harry Potter world rules now; But I have also written a whole new story around it and added songs. It could be so good but nobody ever wants to know anything different unless you are already famous. HARRY BOARDMAN said it could have been MASSIVE. A multi-media musical project by Chris Joe Beard (ex Purple Gang) first performed by the “Joe Beard Band” in the early 1980`s at Arts and Folk festivals and presently archived with the National Trust (at Shrewsbury HQ-Atcham house)- at the Trust`s request. This began life as a folk- rock/ gothic/ music/slide-show with narration performed at folk and arts festivals and also by Joe with the Alderley Edge Girl`s School Choir and drama dept.-(St.Hilary`s in 1982). Supported by NW Arts, it became a radio show and was featured by Piccadilly Radio (halloween night) and Radio Manchester (new years eve). The project gained the interest of Joe Boyd of Hannibal records the legendary folk rock producer (Nic Drake, Fairport Convention, etc.) but finances were not available then to give the project the high quality production it deserved. Some demo tapes and radio show recordings exist however. The slides ,music and songs also remain with the author and have been developed/ improved over time. The project has remained dormant for many years, but it is planned to revive and modernise it for today`s market; Also to re-adapt it for suitable school use for several age groups engaging dance, drama and narration. The music and songs are recognised for their high quality and atmosphere, reflecting the mystery and drama of the various events and characters contained within the storylines. The story begins in the dark ages with the wizard (who, it is said, is Merlin himself) vainly searching for Sir Oscatell - the lost sleeping knight and his milk white steed – Rondar, who are both needed to complete the 100 enchanted sleeping knights /steeds, who await the Wizard`s call to defend the country in time of dire peril. An ancient curse upon Sir Oscatell (who was found beneath an eagle`s nest when an infant, upon a rocky outcrop called “the Edge” by local landowner Lady Oscatell and subsequently raised highborn ) meant that at the age of 21 years to the day, he would be compelled to drink at the Wizard`s well beneath the edge and see reflected in the water the face of his real mother. She being a sorceress, ”Corniva”, an old rival of the Wizard; it was he who enchanted the eagles to steal the sleeping infant from Corniva. From then on he would forget his past and wander the land to look for his real mother and father, eking out a meagre living off the land until the fateful day when “the Wizard” finds him on his way to market to sell his white horse. At the fair, as predicted, no-one would pay the price, although all agreed that the horse was magnificent - though all were afraid of the strange fearful look in the horse`s eyes. At this to a tremendous noise, the rock known as the ”golden stone” cleaved open, to reveal a pair of ornate iron gates, which the Wizard opened with a creaking noise saying “Be not afraid yet follow me. No harm shall come to thee ”Will” and the horse followed the wizard down into the cavernous passage lit by the wizard`s enchanted staff, now gleaming light into the darkness. Further and further they travelled along, until an eerie blue light shone ahead and .into a brightly lit cavern-they entered. In the vast long cavern, alongside the gleaming walls, stood 100 stalls and in each stall rested a sleeping knight with a sleeping horse nearby. On the walls hung the armour and weaponry—yet one stall remained empty . Turning, the Wizard said to "Will”, "Until now this stall has remained empty awaiting its rightful occupant-Sir Oscatell and the horse Radnor. At last you are both here and the wondrous cavern`d band is now complete." Following the publication of The Manchester Ballads by Harry and Roy Palmer, Diana Stenson conducted an interview with Harry for a special programme on BBC Radio Manchester (now BBC GMR). "I do remember complaining to Harry that he'd given me all the wordy broadsides to sing, like the Great Western Railway (awful stuff: "The Great Western Railway will beat them all hollow, and whoever first thought of it was a wonderful fellow"), while Steve Mayne and Mary Humphries got all the grand ballads. Harry's reply was something like, "That's because you'll make them sound like decent songs", which was a bit of a compliment from him. I still have most of the lyric sheets in my file. "The Manchester Ship Canal" stayed in my repertoire (and Harry took it up, too, after I'd made a "decent song" out of it! ), and I was also flattered to be asked to sing "The Miners' Lockout", which I'd always thought of as "Harry's song" since hearing it on "Owdham Edge". 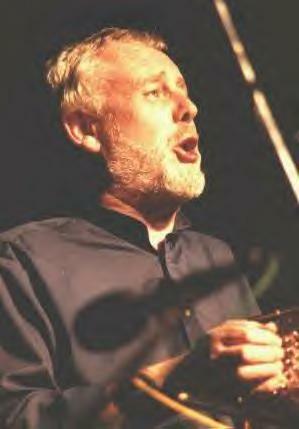 The programmes featured Harry, Bob Morton, Brian Peters, Steve Mayne, Nick Dennerley, Lesley Boardman, Wilf Darlington and Mary Humphreys plus Enzo Puzzovio - a hurdy-gurdy player hired for the recordings. More information about these programmes to follow.